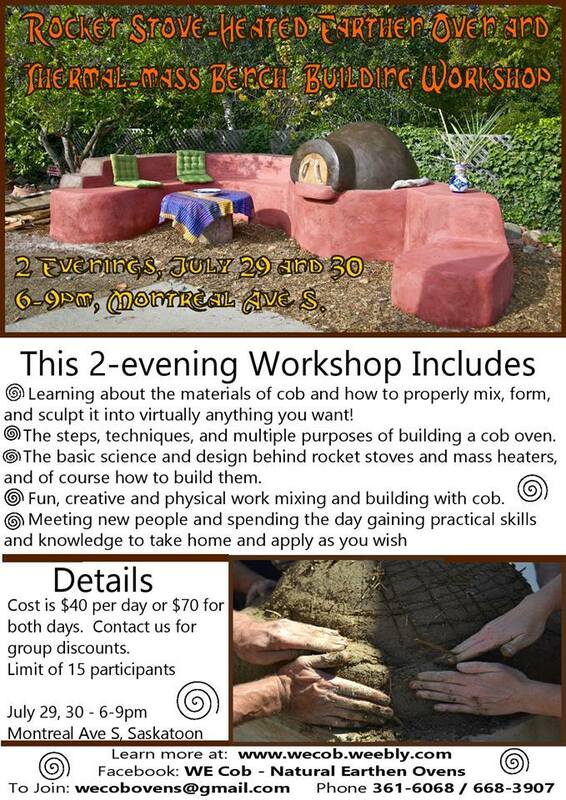 Check out this exciting workshop being offered by WE Cob Natural Earthen Ovens. or call Steve at 361-6068 or Dayle at 668-3907. Inquire about Permaculture Saskatchewan member discounts and group prices. For this workshop we are going to do a first; combine a cob oven with a thermal-mass heater. This means that while heating and using the oven, the excess heat will be redirected through a bench, heating it up and allowing for a slow release of heat for an extended period of time. There will be a lot to build and learn, so we hope you can make it out for those 2 evenings at the end of July. 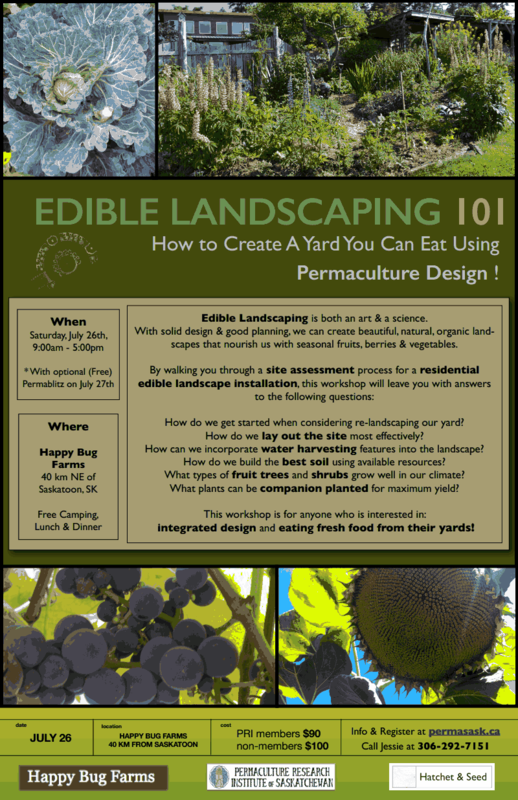 Hatchet n’ Seed Permaculture, Permasask and Happy Bug Farms are teaming up to provide a fun filled, hands on, practical weekend where we explore the process of residential edible landscape installation. We will consider things like – how to get started when considering re-landscaping your yard – how to lay out the site most effectively – how to incorporate water harvesting features into the landscape – how to build great soil using available resources – what types of fruit trees and shrubs grow well in our climate and what plants can be companion planted for maximum yield. Tayler and Solara of Hatchet n’ Seed, who are teaming with experience from many different climates, will facilitate Saturday’s workshop, where we will discuss how to match plant guilds to a water system for maximum benefit. 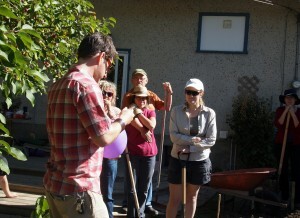 On Sunday, Happy Bug Farms will facilitate a Permablitz to implement our design around a household graywater pond. They will also offer tours of the farm, and offer a broader context of how the pond system will improve productivity on the rest of the quarter section. This workshop will benefit homeowners who would like to maximize the benefits of rainwater from their roof, city planners who are looking for ways to decrease the load on storm water systems, farmers interested in applying these ideas on a large scale. 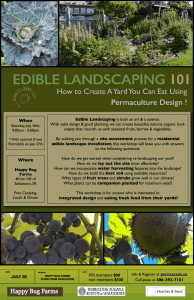 It is for anyone who is interested in integrated design and eating fresh food from their yards. Cost is $90 for Permasask members; $100 for non-members. This fee will include camping, home style lunch at the farm (outdoors if its not raining! ), and will probably feature products from our backyard, including eggs from pasture raised hens. Happy Bug Farms is located 40 minutes North East of Saskatoon. Directions will be emailed to you. Free camping is available for workshop participants. Lunch will be provided each day, as well as supper on Saturday and breakfast on Sunday (for campers). 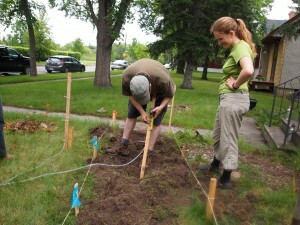 We help clients who want to apply a permaculture design framework to their projects to ensure a successful completion. Projects we support include: edible landscape transitions, community orchards, permaculture design education, water harvesting earthworks and multifunctional, carbon sequestering tree systems. Since 2010, we’ve served a broad range of clients: residential, commercial, institutional, agricultural and community organizations. 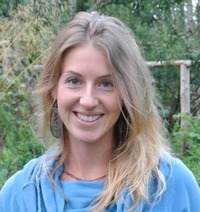 Solara’s passion for permaculture design has seen her complete two Permaculture Design Certificates as well play a Teacher’s Assistant role in an Urban Permaculture Design Course. With a BA in Environmental Studies and Anthropology, she sees regenerative agriculture as a key strategy for environmental & cultural wellbeing. 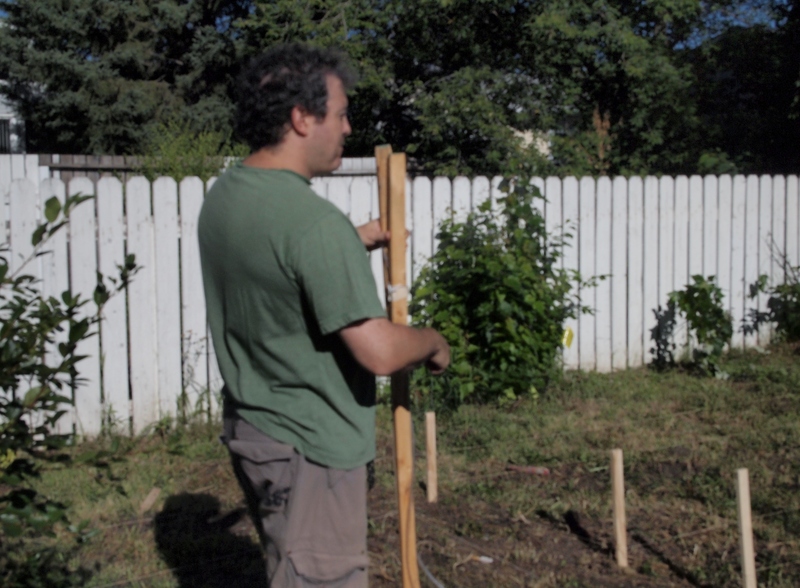 Solara is now living and working on a 3-acre polycultural Garden Farm in North Saanich, BC. Current work includes the propagation of hundreds of multi-functional perennial plants for Hatchet & Seed projects, teaching applied permaculture workshops and consulting for organizations who seek to apply permaculture thinking to their operations. Tayler grew up on the prairies of Saskatchewan with a keen interest in social and environmental justice. 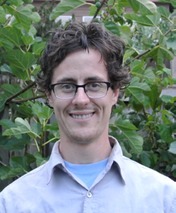 After a degree in International Development Studies and 5 years the working in the forest industry (in Saskatchewan, Alberta and Britain) he moved to Victoria, BC in 2010 to pursue further education in organic horticulture and permaculture design. He’s now honing his skills as a small business owner and project manager with a goal to ensure solutions based ecological landscape development. He’s keen to play an active role in shifting the way we utilize land on this planet for our own sustenance, from an extractive paradigm to one that is regenerative. Presented by the Permaculture Research Institute of Saskatchewan. 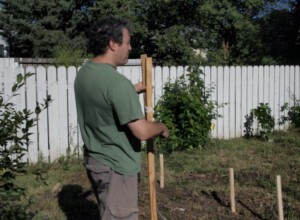 At this full-day workshop you will learn about the fundamentals of permaculture design and how to apply the principles to your own garden and life. There is limited space, so be sure to register early to reserve your spot. We will provide beverages and snacks.Please bring your own lunch. To register: click on Intro to Permaculture Registration form below, download, print and complete the form and mail to the address on the form.